In need of a holiday and fancy the idea of a quick beach break in Southeast Asia? The team from Jebsen Holidays has put together a short and sweet itinerary on Vietnam’s central coast that ticks plenty of boxes as far as relaxation and exploration go. The “Ninh Thuan – Amanoi” three-day trip has a whole bunch of inclusions, making it a simple holiday to plan. And the cliff-top accommodation is about as swish as it gets! for the layover in HCMC, a choice of two different half-day city tours, including roundtrip airport transfers, or a spa treatment. Minimum two adults travelling together. Valid for stays until 31 December 2019. Subject to availability. Combining the Sanskrit-derived word for “peace” with noi, meaning “place” in Vietnamese, Amanoi is the perfect spot for a relaxing beach break. The contemporary beachside resort has a variety of villas, pavilions, residences and spa houses for guests. It sits on a wide promontory overlooking Vinh Hy Bay on a particularly dramatic chunk of Vietnam’s coastline. And it’s embraced by the Nui Chua National Park and a marine reserve that’s home to coral, tropical fish species, and hawksbill and green sea turtles. The resort’s design fuses contemporary elegance with traditional Vietnamese architectural styles. Guest accommodation joins to facilities by pathways winding through coastal rocks and vegetation. You can enjoy the jaw-dropping views from the hilltop infinity pool, spend time in the Central Pavilion, which houses a restaurant, bar and library. Or head down to the Beach Club, with a dining area and second swimming pool overlooking a private sandy beach. The Aman Spa includes five double treatment rooms, four with outdoor terraces; two hydrotherapy suites. Each features a heated stone treatment table, a steam room, Jacuzzi and cold plunge pool; hand and foot therapy rooms; and a finishing salon. Fitness options include a light-filled gym, a Pilates studio, a yoga pavilion set over the water, and two tennis courts. The restaurant serves Vietnamese and international cuisine, with an air-conditioned interior that opens on to a shaded alfresco dining area. The bar is set beneath soaring eaves with views of rolling hills and distant mountains. After arriving from Hong Kong at Tan Son Nhat International Airport in Ho Chi Minh City, guests have a few options available to them before boarding the onward Nha Trang flight in the afternoon. Explore Saigon’s main architectural and cultural features with viewings of the historic Reunification Palace, the architectural treats of French colonial Notre Dame Cathedral, the building of the City People’s Committee, along with visits to the city’s famous Post Office and Opera House. You’ll also have a chance to enjoy the shopping mecca that is the famous Ben Thanh Market. Cholon is a predominantly Chinese district of Ho Chi Minh City, and is said to be the largest “Chinatown” in the world by area. 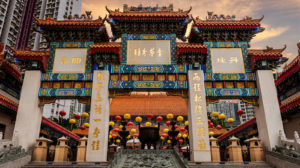 This tour takes guests to experience the area, including a visit to Thien Hau Temple. Originally built as early as 940, then rebuilt many times over it’s dedicated to the Chinese sea goddess Mazu, who was said to be able to predict the weather and protect sailors. Cho Lon Mosque, Cha Tam Church, Giac Lam Pagoda and shopping at Binh Tay Market are also on the itinerary. Enjoy a 90-minute spa treatment, with your choice of a foot massage, aromatherapy session or Thai body massage. After the tour, you’ll be transferred back to the airport for your flight to Nha Trang.